Let us say HELLO to a brand-new Air Asia promo fare tickets for trips to domestic and international destinations! 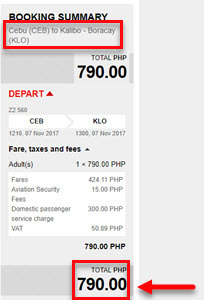 Grab Air Asia sale tickets which starts at P790 for Cebu to Kalibo travel. Cheapest fare from Manila is the route Manila to Iloilo at P990. As for international trip, fly from Manila to Kota Kinabalu for only P1,490. Manila to Hong Kong journey cost only P2,390 while a Taipei trip is P1,890. Air Asia promo booking period is until October 15, 2017. However, book tickets fast! Seats on sale are limited! 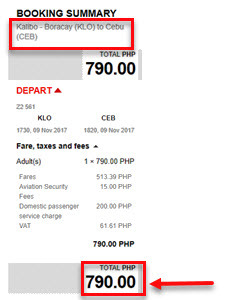 Air Asia promo travel period: October 2, 2017- March 31, 2018. The Air Asia promo tickets can be availed thru online booking at Air Asia website: www.airasia.com. Promo code is not needed for booking. Booking online the Air Asia sale tickets is possible even without a credit card. Booked tickets may be paid thru Air Asia Payment Partners such as Cebuana Lhuillier, EC Pay, Robinsons, 7-Eleven, SM Store, M Lhuillier, Bayad center. Here is the List of 2017 Holidays and Long Weekends to guide you in planning your trips. 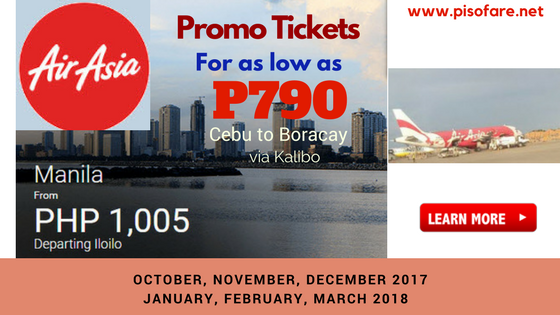 Want to receive info on new promo fare and sale tickets 2017- 2018 of Air Asia, Cebu Pacific Air, Philippine Airlines and other travel updates? LIKE and FOLLOW PISO FARE TICKET on Facebook!!! AIR ASIA IS BEST FOR ME TO AVAIL PROMO TICKETS.